Rational and humorous, this wellness guide uses an amusing courtroom model to give helpful, goal-attaining advice. Self-improvement can be logical and sustainable with the right mind-set. This guide to positive change comes from brothers Ryan Penny and Sean Penny, who have had success as coaches in the field of weight control and exercise. They cite wisdom from other experts along with case studies of their own clients in this amusing, cleverly organized manual. Something Bigger is an instructive handbook for overcoming negative thoughts and habits by resetting satisfaction goals. Calling themselves the Wellness Brothers, the authors state they have helped thousands of people achieve health, weight, and well-being goals. A few well-placed cartoons augment their text. The basic premise of the book is that the power of one’s mind can be used to attain a positive satisfaction level. The protracted metaphor for attaining success in their program is an imaginary courtroom where Judge MAX (a stand-in for the reader’s mind) presides and can be swayed by arguments from two attorneys, MISS and FUSS. MISS is lackadaisical and impulsive, steering the judge to the quickest means of satisfaction (cookie, cigarette), while FUSS is rational, preferring to fulfill long-term goals (avoid lung cancer, meet weight-loss goals in a year). The judge often rules in favor of MISS and must be swayed to support FUSS in order to make real gains. The authors believe that if what one doesn’t want is clear and avoidable, then what one does want and how to accomplish it is also innately accessible. The Penny brothers write convincingly, presenting difficult challenges, such as weight loss and smoking cessation, with a touch of humor, without detracting from the seriousness of the objectives. While they are careful not to make their method seem easy, they present it as both logical and doable. For example, they note “self-control gets weaker through the day,” so good sleep and healthy eating habits are “currency” for holding onto higher priorities. In the final chapter, the authors offer a seven-step program for reaching one’s goals and overcoming one’s self-set barriers; the steps include positive thinking, physical exercise, and avoidance of nicotine and caffeine in favor of plenty of water. The basic tenets of their plan are familiar, but their unique presentation can make such ideas palatable even to those with self-help burnout. By using the dramatic image of the courtroom, and constantly referring to it, the authors remain focused on the book’s thesis. It’s an excellent teaching method; we all experience the duality depicted: MISS can sway one’s inner judge, unless FUSS can reset one’s satisfaction priorities. Even fussy readers will not find an extraneous comma or a misplaced quotation mark in this well-edited, professionally designed guide. Important advice is in bold, acronyms encourage memorization of steps, and lined sections are offered for the reader’s own lists. 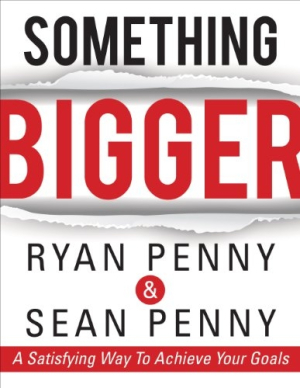 The Penny brothers offer a rational, workable approach to goal realization. With the help of Something Bigger, readers seriously seeking a way out of negative habits can use the book’s practical suggestions to set aside short-term, temporary rewards to pursue sustainable goals.